This is a more significant game for the landscape of the NFC West than pretty much everyone would have guessed when it first popped up on the schedule. 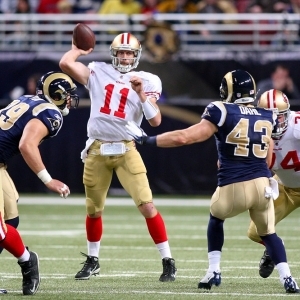 The Niners were supposed to be the class of the division, with the Cardinals far behind. Yet the winner of this one is guaranteed at least a share of first place at the end of the night. If San Francisco wins, that lead will be comfortable. However, an Arizona win could mean a three-way logjam on top if the Seahawks can beat the reeling Lions on Sunday. In other words, motivation should not be in short supply for either team in this one. I’m not convinced that playing on Monday night is that much different than playing any other time, but if it is then that’s bad news for the Cardinals San Francisco will be playing in their 67th Monday night game here, and they sport an impressive 41-25 record to date. That’s third best in league history — only the Steelers and, surprisingly, the Seahawks have done better. Arizona has played in far fewer games, but their 6-14-1 record in 21 appearances is only better than Houston and Atlanta. The season hasn’t been particularly long yet, but it already seems like the Cardinals have played two seasons. The first one lasted four games. They were 4-0, and they qualified as the biggest surprise in the league. Their offense was surprisingly competent, and their defense was stout. It didn’t make any sense, but it almost seemed sustainable. In the next three, though, they have sadly looked a lot more like the Cardinals that we have long known and learned to essentially ignore. In two of those three losses they have looked just plain lousy, and in all three they have really struggled on offense. They are still very strong against the pass — fourth in the league in yards allowed — but the offense is sputtering, they have two quarterbacks but might as well have none, and they aren’t frightening anyone right now. The question, of course, is whether they can recapture what worked so well in the beginning, or if their more recent play is more accurate of what they can do. I don’t know about you, but I think the latter theory holds more water. While we certainly have to question which Arizona team will show up here, we can’t make any assumptions about the 49ers either. In four of their five wins they have looked like the best team in football. In the fifth win against Seattle they showed a lot of toughness to persevere in a brutal defensive battle. The two losses, though, have been incomprehensible. They had no business losing at Minnesota, but at least there were excuses — they could have been overlooking a surprising team with a solid defense, and so on. The loss at home to the Giants, though, was just bizarre. They should have been motivated by revenge and by the chance to prove themselves against the defending champs. They didn’t even show up for the game. It was as flat an effort as we have seen from any team all year. There was no hint that it was possible the week before, and there was no sign that it had ever happened the week after. When a team has the ability to be so good and so bad it makes bettors very nervous — and it makes them particularly hard to handicap. There is no reason that this team should be anything but sharp and dangerous in this one, but then the same went for the two losses as well. Any analysis of this game comes down to one factor — in order to win the Cardinals need to score. The Niners defense is tops in the league against the pass and 10th against the run. Arizona’s offense is no better than 26th in either category, and much worse than that the last three weeks. In order to have any faith at all in the Cardinals in this one you need to be convinced that the two-headed monster (I use that term loosely) of Skelton and Kolb can find a way to make this offense look better against a very good defense than they have the last three weeks against ones that aren’t nearly as impressive. That’s a very tall order, and I for one am not convinced. The line opened in most spots at 6.5, though some books tried it at the key number of seven, and even at 7.5. It quickly leveled off at 6.5. The solid majority of bets have come in on San Francisco, so there is a chance it will climb up to seven again. That means that Niners’ backers might want to act early this week before the public money pushes the line up. The total opened at 37 and has climbed half a point from there. San Francisco has covered the spread in six of the last seven meetings between these squads, but the lone exception came late last year in their most recent meeting. The under is 5-0 in Arizona’s last five games as an underdog. The under is 4-0-1 in San Francisco’s last five against teams with winning records. I really like this San Francisco team despite their periodic brain cramps. The defense is as good as there is, and they will show it against this pathetic Arizona attack. The offense will find room to move against the Cardinals and will do some damage. The Niners will cover fairly easily in a game that will go “under” the total, though I will jump on the 6.5 before it moves up.